3. Trademarks. Monmouth Historic Inn, Monmouth Plantation, 1818, 1818 Restaurant, Restaurant 1818, Taste of the South, The Tasting Table and others are either trademarks or registered trademarks of Monmouth Historic Inn. Other product and company names mentioned on the Site may be trademarks of their respective owners. 4. Limited Right to Use. The viewing, printing or downloading of any content, graphic, form or document from the Site grants you only a limited, nonexclusive license for use solely by you for your own personal use and not for republication, distribution, assignment, sublicense, sale, preparation of derivative works or other use. 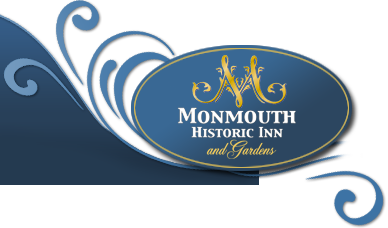 No part of any content, form or document may be reproduced in any form or incorporated into any information retrieval system, electronic or mechanical, other than for your personal use (but not for resale or redistribution) without written permission granted by the General Manager of Monmouth Historic Inn or owners of Monmouth Historic Inn. 8. Disclaimer and Limits. THE INFORMATION FROM OR THROUGH THE SITE ARE PROVIDED “AS-IS,” “AS AVAILABLE,” AND ALL WARRANTIES, EXPRESS OR IMPLIED, ARE DISCLAIMED (INCLUDING BUT NOT LIMITED TO THE DISCLAIMER OF ANY IMPLIED WARRANTIES OF MERCHANTABILITY AND FITNESS FOR A PARTICULAR PURPOSE). THE INFORMATION AND SERVICES MAY CONTAIN BUGS, ERRORS, PROBLEMS OR OTHER LIMITATIONS. WE AND OUR AFFILIATED PARTIES HAVE NO LIABILITY WHATSOEVER FOR YOUR USE OF ANY INFORMATION OR SERVICE. IN PARTICULAR, BUT NOT AS A LIMITATION THEREOF, WE AND OUR AFFILIATED PARTIES ARE NOT LIABLE FOR ANY INDIRECT, SPECIAL, INCIDENTAL OR CONSEQUENTIAL DAMAGES (INCLUDING DAMAGES FOR LOSS OF BUSINESS, LOSS OF PROFITS, LITIGATION, OR THE LIKE), WHETHER BASED ON BREACH OF CONTRACT, BREACH OF WARRANTY, TORT (INCLUDING NEGLIGENCE), PRODUCT LIABILITY OR OTHERWISE, EVEN IF ADVISED OF THE POSSIBILITY OF SUCH DAMAGES. THE NEGATION OF DAMAGES SET FORTH ABOVE ARE FUNDAMENTAL ELEMENTS OF THE BASIS OF THE BARGAIN BETWEEN US AND YOU. THIS SITE AND THE INFORMATION WOULD NOT BE PROVIDED WITHOUT SUCH LIMITATIONS. NO ADVICE OR INFORMATION, WHETHER ORAL OR WRITTEN, OBTAINED BY YOU FROM US THROUGH THE SITE SHALL CREATE ANY WARRANTY, REPRESENTATION OR GUARANTEE NOT EXPRESSLY STATED IN THIS AGREEMENT. ALL RESPONSIBILITY OR LIABILITY FOR ANY DAMAGES CAUSED BY VIRUSES CONTAINED WITHIN THE ELECTRONIC FILE CONTAINING THE FORM OR DOCUMENT IS DISCLAIMED. WE WILL NOT BE LIABLE TO YOU FOR ANY INCIDENTAL, SPECIAL OR CONSEQUENTIAL DAMAGES OF ANY KIND THAT MAY RESULT FROM USE OF OR INABILITY TO USE OUR SITE. OUR MAXIMUM LIABILITY TO YOU UNDER ALL CIRCUMSTANCES WILL BE EQUAL TO THE PURCHASE PRICE YOU PAY FOR ANY GOODS, SERVICES OR INFORMATION. Web sites are not investigated, monitored or checked for accuracy or completeness by us. 17. Miscellaneous. This Agreement shall be governed by and construed in accordance with the laws of the State of Mississippi (without regard to conflict of law principles). Any cause of action by you with respect to the Site (and/or any information, products or services related thereto) must be instituted within one (1) year after the cause of action arose or be forever waived and barred. All actions shall be subject to the limitations set forth in Section 8 and Section 10. The language in this Agreement shall be interpreted as to its fair meaning and not strictly for or against either party. All legal proceedings arising out of or in connection with this Agreement shall be brought solely in Natchez, MS. You expressly submit to the exclusive jurisdiction of said courts and consents to extra-territorial service of process.